Once again, more ATCs! Cut the unfinished project into pieces and buttonhole stitched my little heart out all day yesterday to come up with seventeen more ATCs. I called this series of ATCs Broken Dishes because they remind me of pieces of broken china all ready for making mosaics. I am going to have to find something new to work on today - I have about three of those holes worn in my fingers that your needle just wants to slip into so no more cross stitch. The muscle in my thumb is still really sore from the knitting frenzy last week so don't think I should do that today. Hmmmm - I might actually have to work instead of stitch! 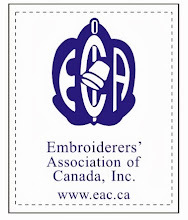 The Embroiderers' Association of Canada has their ATC swap every year so how is it that it always sneaks up on me the way it does? Anyway, as usual I was scrambling at the last minute to come up with some Artists Trading Cards to send in for the swap. This year I took a south western style sampler that was already stitched and measured out four 3-1/2 X 2-1/2 inch pieces. I used a very thick stiffener with double sided adhesive and sandwiched it between the stitched pieces and some white cotton for the back. Once the little sandwiches were ironed together all I needed to do was buttonhole stitch around the outside edges and then add my information to the back using a very fine tipped permanent parker. So, they didn't turn out too badly and off they went in the mail, hopefully to arrive in time for the swap. Who could resist these Easter colours? Not me! I certainly didn't need to buy more cotton yarn - I am sure there is already lots in "the room". It went against my current de-stashing efforts too. Simply, I couldn't resist the colours! lol So, to negate the stash building guilt, I had to use up the balls right away and here is what I did with them. I did a little better with the butterfly - still not perfect by a long shot but they wash dishes, perfect or not. I find knitting dishclothes very therapeutic. I think it is that in a day or so you have a finished project. Even if they aren't perfect, people are always happy to get them. I got fancy here using up the last little bit of purple. Love these colours - the blue is just so pretty and I love Emily's heart design. Last but not least! I did this one to use up every last scrap of these balls of yarn. So, I was successful in not adding anything to my stash, not even scraps. And I got to satisfy my urge to buy this yarn and have a nice little pile of dishcloths. Not very exciting but I call it a success. I love finding goodies at the thrift store. Just about anything crafty or stitchey grabs my eye. This little kit was one that came home with me recently. For $1.00 who could resist? Everything was there still, all the felt, threads,pattern,etc. so I filled a few spare minutes recently doing up the ornaments and here they are! They were fun to do, very relaxing which is nice for a change. I think they are cute now they are done and better yet, so does dd, so I will likely put them away until next Christmas to give them to her. I am liking the idea of finishing off some of these projects I have picked up as well as ones I have started and not finished so we'll see what comes next! Another small cross stitch project done! This one is a name tag for the National Seminar of The Embroiderers' Association of Canada to be held in Winnipeg in June. 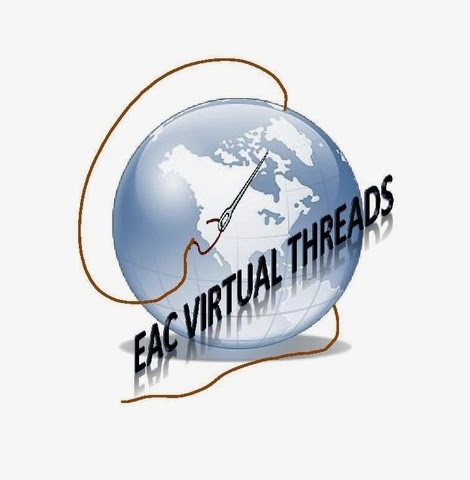 It promises to be a huge amount of fun, especially since it is EAC's 40th Anniversary! For the first two days I will be taking Jacobean Brilliance, taught by Alison Cole. I love goldwork and am very excited about learning techniques that are new to me. On my free day, I opted out of city tours and the like and signed up for a one day class with Lynn Payette for “Treasure” Pin or Pendant. For my last two days of classes, I am signed up with Sylvia Murariu for a project called Passion Flowers. It is a combination of Romanian Point Lace, Surface Embroidery and Stumpwork. I took a class from Sylvia before and she is a great teacher. You can find out more about these classes and others still available for registration by checking out the brochure on the EAC website. Look at this first photo - it looks like one of those photo puzzles, Whazzit? Well,as you can see it is the top of my little pinholder! I chose the pattern which read Souvenir of Saskatoon 2012. The pattern was modelled after vintage postcards. After affixing the perforated paper to the pinholder you add three little silk ribbon bows to finish it off. Isn't it the cutest thing? Now that I have caught up on my crazy quilt round robin obligations, I am dabbling in a few other small projects I have sitting around like this. I feel like it is time for an occasional break from cq, and time to play around with other forms of needlework again.